The DDR, Deutsche Demokratische Republik, or German Democratic Republic, as it is called in English was proclaimed on October 7, 1949. Not too long afterwards, the old Personalities Series definitive postage stamps of the post-war Soviet Occupation Zone were phased out, and definitive postage stamps for the new socialist republic began to appear. 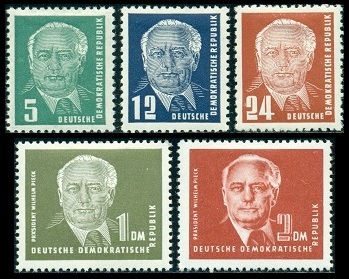 The first definitive postage stamps for the German Democratic Republic all bore the profile of President Wilhelm Pieck. 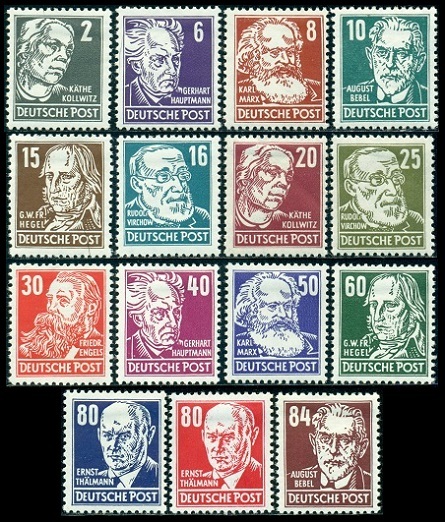 The five DDR definitive postage stamps shown above (Mi. #251-55, Sc. #54-57A) were issued between May 1950 and January 1951. The 12 Pf., 24 Pf., and 1 DM denomination stamps were typographed, the 2 DM denomination stamp was lithographed, and the 5 DM denomination stamp was engraved. All of these stamps have the Michel Wz. 1 - Multiple Flowers watermark. Beginning in August 1952, a new 5 Pf. denomination was added and four of the 1949 Wilhelm Pieck definitive stamps were re-issued. The 5 Pf., 12 Pf., 24 Pf., and 1 DM denominations were typographed. The 2 DM denomination was lithographed. All of these new stamps (Mi. #322-26, Sc. #113-17) are printed on either ordinary or coated papers that have the Michel Wz. 2X - Multiple "D D R" & "Posthorn" (horizontal) watermark, or the Michel Wz. 2Y - Multiple "D D R" & "Posthorn" (vertical) watermark. Some of the varieties are quite rare. Please see the Michel Deutschland-Spezial-Katalog for details. Beginning in September 1952, the Soviet Occupation Zone Personalities Series definitive stamps of 1948 were re-issued. These re-issued stamps are all typographed. All of these new stamps (Mi. #327-41, Sc. #122-36) are printed on either ordinary or coated papers that have the Michel Wz. 2X - Multiple "D D R" & "Posthorn" (horizontal) watermark, or the Michel Wz. 2Y - Multiple "D D R" & "Posthorn" (vertical) watermark. Some of the varieties are very rare. Please see the Michel catalog for details. During early 1953, the design of the 1 DM and 2 DM denomination definitive stamps was re-drawn (Mi. #342-43, Sc. #120-21). The most obvious differences are the clearer portrait and the solid color numerals. 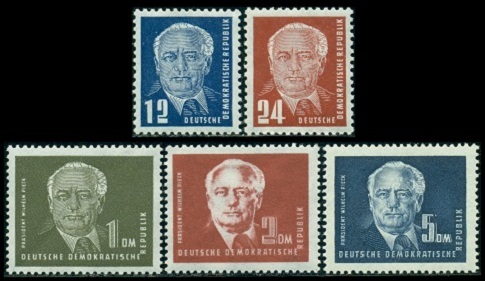 All of the DDR definitive postage stamps of this period were replaced by the attractive new Five Year Plan definitive series, beginning in August 1953, thus, many of the later issues are quite scarce, especially in mint condition. Friedrich Wilhelm Rheinhold Pieck (1876-1960) was a German political activist and Communist politician. Pieck joined the Communist Party of Germany in 1918, but he soon had to flee into exile. He returned to Germany in 1922 and became a founding member of International Red Aid. After the Nazi Party came to power in 1933, he fled to the USSR, where he became active in the Communist Party there. 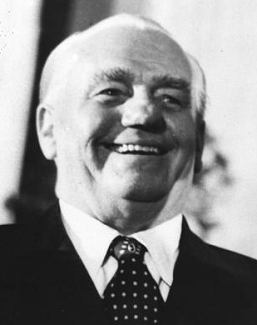 In 1949, Pieck was elected as the First President of the German Democratic Republic, serving until his death in 1960. After his death, the office of President was abolished. His successor, as head of state, was Walter Ulbricht (1893-1973) who served under the title "Chairman of the Council of State".